Your job as a real estate agent requires a lot of work, a lot of tools and resources, and a lot of time. For many Realtors, there is just too much to get done in a standard 40 hour work week. At some point, a decision needs to be made: what can you outsource. In order to decide what to outsource, you should first understand the value of your time. And the value of your time can be found by knowing how much you effectively earn per hour, so that you have a baseline. Then replacing the comma with a decimal makes $21.685 or $21.69 per hour. The reason this calculation works is that there are effectively 2000 hours of work in a year, assuming 2 weeks of vacation. So 8 hours in a work day, 5 days a week (8 hours x 5 days = 40 hours in a week), and working 50 out of the 52 weeks in a year (40 hours x 50 weeks = 2000 working hours in a year). Take a minute to calculate your effective hourly rate based on your income as a Realtor over the past year. Ok, enough math, for a little bit anyway. Let’s talk about why knowing your hourly rate can help you decide how to spend your time and money. The effective hourly rate that you calculated can help you understand what tasks and chores are valuable to do on your own, and when it makes sense to pay someone else to do them. Does it make sense to spend 45 minutes to mow your lawn, or to pay the neighbor’s kid $45 to do it each week (cost of your time is $60/hour)? Does it make sense to spend 2 hours each week to clean your house, or to get a cleaning service to do it for $150 each time (cost of your time is $75/hour)? Does it make sense for you to spend 10 hours to do your taxes, or to pay and accountant to do them for $500 (cost of your time $50/hour)? There are some tasks in life that are worth it for you to do, and some that make sense for you to outsource. In general, a real estate agent just starting out in the business has more time than money. This Realtor hasn’t closed many deals, and doesn’t have much of a pipeline. In this Realtor’s case, it makes sense to save money and mow their own lawn, clean their own house, and do their own taxes. That’s not saying these agents aren’t busy building their business. However, their money is much more valuable at this point in their career, because their hourly rate is lower. Meanwhile, an experienced real estate agent can put a higher dollar value their time than the new Realtor. This experienced Realtor has a substantial database that continually provides business and referrals, and a streamlined marketing process to generate new leads. In this Realtor’s case, they can afford to outsource those time consuming tasks because they earn more money per hour than the cost of those services. Their time is better spent on their business than it is to spend 10 hours doing taxes. Their time is much more valuable at this point in their career, because their hourly rate is higher. Depending on how you value your time and money can help determine whether to do the common chores in your life, or if it makes sense to outsource them. However, the actual cost of these chores provides just a general guideline. Seasoned Realtors can still do their own taxes, and new Realtors can pay someone to clean their house. On a personal note, I enjoy mowing the lawn, so I wouldn’t give up that task no matter how much I earn. Knowing how much your time is worth can also help you determine if outsourcing certain job functions makes sense. 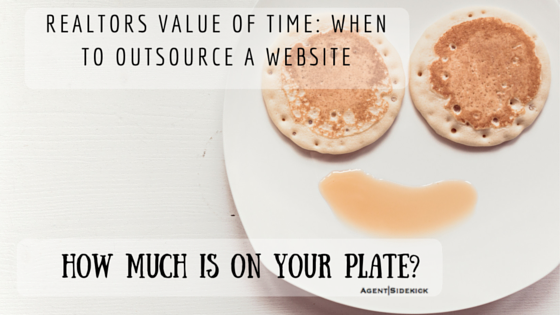 We just went over how the value of your time can help you justify the chores to outsource. But the value of your time becomes even more important with your business. The goal is to get more done and to be more efficient without working more hours. For example, when Realtors start building a team, the first function they usually hire for is an administrative assistant. An administrative assistant can take care of many of the day to day tasks. These tasks take up a lot of the Realtor’s time, but are easy to train someone else to do for a relatively low cost. If a new Realtor makes only $20k/year, then it doesn’t make sense for that Realtor to hire an assistant at $30k/year. That Realtor will lose money by hiring an administrative assistant. However, if an experience Realtor is making $200k/year, then their time is probably too valuable to do administrative work, so paying a $30k/year for an administrative assistant makes perfect sense. Now that experienced Realtor has more time to either focus on revenue generating tasks, or to scale back the hours that they work. The example of when to hire an assistant is fairly easy to grasp. The cost of the assistant is fixed, and the amount of time they save for the Realtor is obvious. What about outsourcing tools and services necessary for your business? More specifically, does it make sense to outsource your website? In that post, we calculated that making a good website, on solid platform, using quality tools would cost less than $55/month. Meanwhile, the monthly service price of a website from Agent Sidekick is $139 (as of this posting date of July 7, 2016). The net difference of $84/month (139-55=84) is the amount to consider to value your time making a website on your own, versus paying to have it built for you. The next consideration is the actual amount of your time spend building the website. How much time will it take to learn the necessary tools to make the website? How much time will it take to build the website? And how much time will be spent regularly maintaining it? The answers to the learn, build, and maintain questions differ for everyone. Learn: There are a lot of great instructions and resources online for beginners building websites. Additionally, the hosting (Bluehost) and theme (Elegant Themes) companies we recommend both provide great support and have thriving user communities. Build: Building a website does take time. It requires a commitment to learn the tools and to build the website. So make sure that you are the type of person who would follow through once you start, and would keep going if you get stuck along the way. There is no way to determine how long each person would take to build a website. At a minimum, a beginner can expect to spend a few hours to create accounts, purchase services, and install WordPress and the theme. Then allow for a couple of days to get the website looking good enough that you feel comfortable to tell people about it and to ask them for feedback. Maintain: Once the first version of your website is complete, you will continually want to improve it. Because in reality, you probably won’t get it looking perfect on your first shot. For example, the Agent Sidekick website is always evolving – some changes you may notice, and some changes are enhancements on the backend. Websites also need regular updates for technology and security. Another aspect to consider is the your comfort with technology. Are you skilled with new technology, and feel that you would be able to build a website within a few days? Or are you “technology challenged”, in which case it could be weeks for your website to be completed as you struggle with the technology? Every website is different in complexity and amount of information. Every person has a different speed of learning and working with technology. There is no one answer for how long it will take to build a website, but, like most things in life, everything takes longer than one initially thinks. The decision to hire an administrative assistant or even to build a website comes down to “opportunity cost”. Where is your time and money best spent? The cost of a missed opportunity. It is the opposite of the benefit that would have been gained had an action, not taken, been taken—the missed opportunity. In layman’s terms, opportunity cost means “how much money will you not be earning by taking time away from your business?” If you are the median Realtor that we calculated as earning $21.69/per hour, then every hour you take off from working costs you $21.69. So mow your own lawn, clean your own house, and do your own taxes. In terms of a website, every hour that you spend learning how to make a website, building the website, and maintaining the website costs you $21.69. That means that if a website takes you a work week to create, then it would have cost you $867.60 ($21.69/hour x 40 hours = $867.60), plus the cost of the tools. Based on your hourly rate, how much is the opportunity cost of you building your own website? A business website is important for every Realtor. If you decide that you want to build your own website, then please see our article “How a Realtor Can a Make a Website: The Tools You Need” before you start. Agent Sidekick can help you decide if building a website on your own is right for you, so please feel free to ask us any questions. If you find that your value of your time is too high to spend building a website, then Agent Sidekick can make your business website for you. Please let us know how we can help!